As part of our group’s research activities we are launching a new Comparative Constitutional Change book series. Please feel free to circulate the news to scholars who might be interested in submitting a book proposal. Comparative Constitutional Change has developed into a distinct field of constitutional law that encompasses the study of constitutions through the way they change and covers a wide scope of topics and methodologies. Books in this series include work on constitutional development in the functions of the constitution, the organization of powers and the protection of rights, but also work that focuses on formal amendment rules and the relation between constituent and constituted power. The series includes comparative approaches as well as books that focus on single jurisdictions, and collects research monographs and edited collections allowing different schools of thought to be expressed. 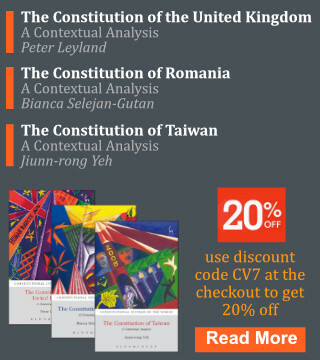 Although this is a constitutional law series, where relevant it may include political science, historical, philosophical and empirical approaches that explore constitutional change. Alkmene Fotiadou is Research Associate at the Centre for European Constitutional Law, Athens and Visiting Lecturer at the Hellenic Open University, Greece.